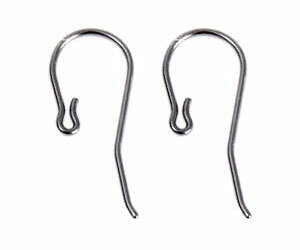 Hypoallergenic titanium earring hooks to replace the hooks on existing earrings or to make your own. Blomdahl snap-on titanium ear hooks do not require tools to attach and are polished to look very close to silver. Love these, I'm allergic to almost everything it seems, but I can finally wear danglies by taking them off their hoop and attaching them to these titanium ones. Using these to switch out all my dangly earrings I could no longer wear due to allergies. I like the matte quality of the metal. For many years I have not been able to wear fashionable earrings due to nickel allergy but these have been a revelation! I can now add on whatever I like and enjoy dangly earrings at last! Thank you. The colour of them is a little dull but that's to be expected with titanium and not really noticeable once in your ear! I am going to order more! Finally my daughter can wear whatever earnings she gets without a worry of getting an allergic response. Easy to use. a bit expensive but obviously good quality, not as easy to clip the dangles on to the hook as I thought, but the up side is that they wont get lost! I can no longer wear gold and silver earrings so bought these to try with some of my favourite drop earrings and they are terrific, no irritation whatsoever. These are so useful. It really increases my choice of earrings to be able to detach earrings from nickel hooks and attach them to these hooks. I have bought several pairs and intend to buy even more. Brilliant. 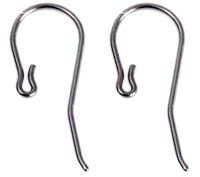 Anybody out there with metal allergies I highly recommend these hooks, make your own dangly earrings very easily, fantastic.